From The Iron Giant to The Incredibles and Up, Brad Bird’s animated movies have become modern classics. But of all Bird’s films, Ratatouille is my favourite. The film has a Trumbo-like storyline. The protagonist Remy is a masterful chef but also a rat and can never be welcome in the kitchens of Paris. Remy befriends a janitor to act as his front, while Remy does the actual cooking. Add the essential ingredients of a Pixar film – excitement, humour, romance, morals, and friendship – bake, and serve up one of the great animated films of all time. The animation throughout is spot-on. Paris breathes. The characters live. Even the CGI food looks delicious. The perfect atmosphere is accentuated by a musical score which makes the action more exciting and fun, while it really drove home parts like Ego’s monologue. I did find the film’s beginning slow. It could have benefitted from an American Hustle feel, with a smooth as fondue presentation. And the simplicity in the opening title bugged me; it didn’t represent the film. 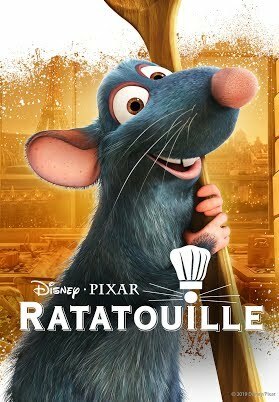 The title should have been superimposed over Paris, shot with the graceful atmosphere that makes Ratatouille, Ratatouille. But I don’t intend to puncture a beautiful soufflé of a film. The critic in this film, Ego, has a lot to say about food critics who can only taste what’s bad. Film critics should also remember that, even when not every part has been baked to perfection, the overall taste may still be delicious! Quick Brown Fox welcomes your book reviews and other book-related pieces and also reviews of movies or of whatever else catches your eye. Details here. Read how to write a book review (or any kind of review) here. William Henry is 13 years old and in grade 8. He’s a big amateur film buff and a professional actor. His dad teaches creative writing and publishes Quick Brown Fox. You can read more film reviews by William here and here, and read about his adventures in Hollywood at age 7 here. Thoughtful, fun, poetic! Great review William! Good review William. I loved the film too, once I persuaded myself to ignore the opening titles (yawn) and see it through with my grandsons who swore it was fantastic. Keep up the good work. I laughed hysterically throughout the film...particularly the times when the rat conceals himself in a chef hat and rides the garbage boy like a cowboy on a bronco. Please don't miss this treat. Highly recommended.